Correcting the pervading myths of Civil War medicine perpetuated by Hollywood dramatizations, this exploration covers how the sick and wounded were treated on both sides of the Mason-Dixon Line. Through detailed research, these essays show there were actually too few amputations, contrary to popular belief; there were many advances made in the understanding and treatment of diseases and wounds to the nervous system, and new surgical techniques were used to treat battlefield injuries once thought to be certainly fatal. These topics and more are treated by experts in their respective fields, including medical education, science, invention, neuroscience, and mental health. 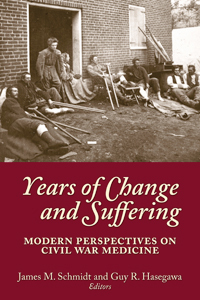 “Years of Change and Suffering adds a whole new dimension to the literature on Civil War medicine: it does not duplicate earlier work, but gives an in-depth treatment of subjects explored only minimally in other works and illuminates the quantum leap in medical knowledge and organization spawned by the vast necessities and cataclysmic suffering of a continent at war. This approach erases the gap between ‘then’ and ‘now’: medicine in our era reflects the fountainhead of Civil War innovation, a never-ceasing evolution that continues to this day.” — from the foreword by Thomas P. Lowry, M.D. “If hindsight is 20/20, then this collection of essays by eight renowned authors and scholars gives us a 20/15 vision of Civil War medicine. A must volume for the library of any Civil War medical historian.” Peter J. D’Onofrio, Ph.D. President, Society of Civil War Surgeons, Inc.